Could this be the year for McCallie and Duke? Two preseason polls for the upcoming NCAA Women’s basketball season have pegged Duke as the most likely contender to reigning national champion UConn this season. ESPNW and Lindy’s Magazine are both ranking Joanne P. McCallie’s team — which returns all of its starters from its 2013 season — second among their Top 25 picks. These predictions will be tested early in the season, as Duke opens its regular season at California (ranked third) on Nov. 10. Then on Dec. 17, the Lady Blue Devils will host UConn (the favorite to repeat as champions). As most Maine sports fans know, Blodgett did choose Maine and helped reverse the fortunes of the Lady Black Bear program. The Nikes might not have been the difference, but that small detail shows just how little McCallie is willing to leave to chance – a philosophy embodied in the title of her book, Choice not Chance, co-written with Rob Rains in 2012. 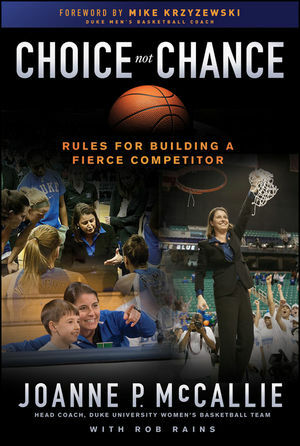 The full title: Choice not Chance: Rules for Building a Fierce Competitor, positions the book as a primer for players and coaches. But Choice not Chance doesn’t read like a coaching advice book; it reads like a heart-to-heart conversation with McCallie as she recounts the highlights of her career, and reveals the thoughts, feelings, and occasional regrets that accompanied them. The book takes readers behind the scenes of McCallie’s playing and coaching career. It’s full of details that those who followed her high school career and her UMaine coaching career will relate to. It also provides context for the decisions McCallie has made. For example, we learn that McCallie left Michigan State for Duke, not only because it was a positive career move, but also because she felt that Michigan State had treated her disrespectfully in contract negotiations the year before, and because she had considered attending Duke as an undergraduate. She also reveals the pivotal role that legendary Duke coach Mike Krzyzewski (who wrote the forward to the book) played in the interview process. McCallie’s book transcends the label of “basketball book” when she writes about family. She is candid about the struggles and the angst of juggling a high-stress career as a college coach with the responsibilities of and the desire to be a good parent. She recounts how she was dealing with a miscarriage the day of Cindy Blodgett’s news conference announcing she’d been drafted by the WNBA. She also reveals how unprepared she was for the rigors of new parenthood, which landed her in the hospital suffering from exhaustion. She makes clear how important it is to have a partner to share the ups and downs of parenting and coaching with, as she gives props throughout the narrative to her husband John. The most poignant parts of the book come when McCallie writes about how her choices affected the rest of her family. She recounts how upset her 13-year-old daughter Maddie was at leaving behind her friends in East Lansing when they moved to North Carolina. It wasn’t until Duke played Michigan State in front of a mean-spirited crowd in Lansing a year later, that Maddie really embraced her mother’s – and her own – new life. The introduction is a heart-felt letter to Maddie, in which she reveals that the writing of this book is the fulfillment of a promise she made when Maddie was only 4. “I want you to understand my life, and in the process your life,” she writes to Maddie, who is now playing basketball as a sophomore at Miami of Ohio. As Duke prepares to open its season next month, Choice not Chance provides a lot of insight into McCallie and her winning methods. If you haven’t read it, this might be a good time to find out how McCallie has come so far so fast.